This article appeared in the February 2019 issue of DeSoto Magazine. Georges Braque, a famous French artist who helped develop Cubism said, “Art is a wound turned into light.” That quote describes the Whitney Children perfectly: 40 life-sized terracotta statues of enslaved African-American children created by sculptor Woodrow Nash. 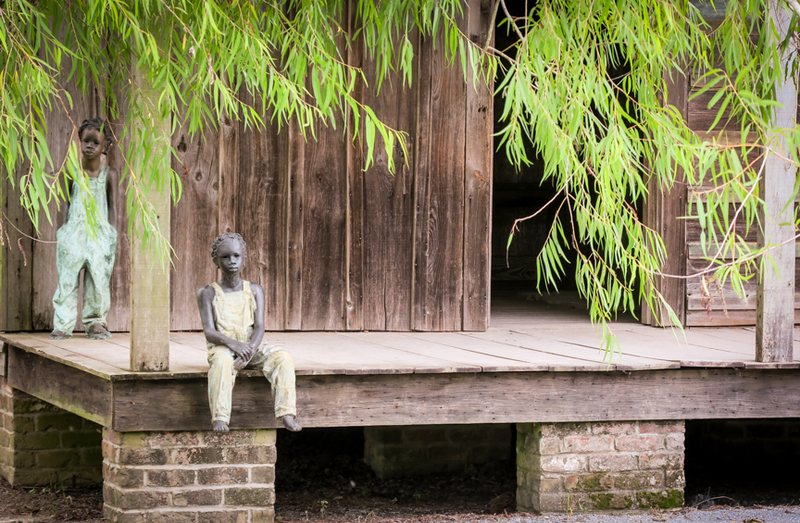 The haunting boys and girls in ragged clothes are scattered around the grounds of Whitney Plantation, in Wallace, Louisiana. 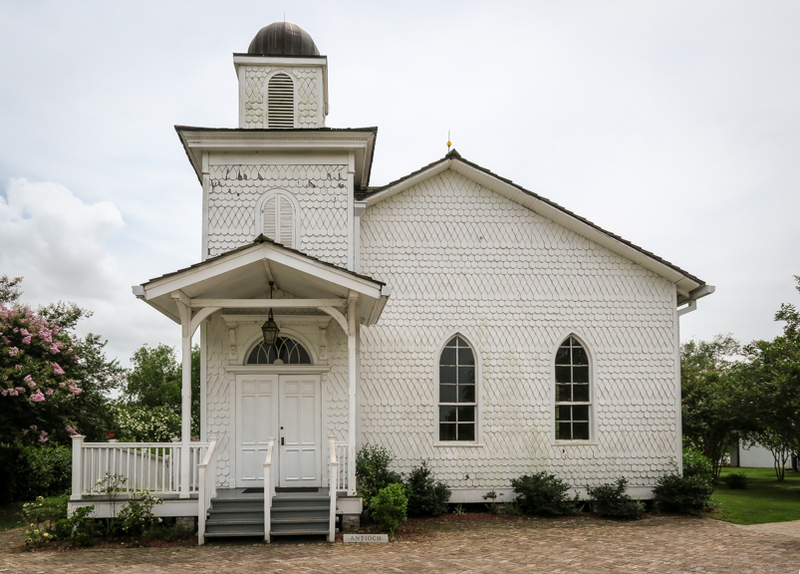 Most are placed in Antioch Baptist Church, the location where guided tours begin. As you move throughout the church, the statues pull at your heart and make you question what they are thinking. If these pieces of art don’t touch your soul, I dare say nothing will. Whitney Children sitting on a church pew. 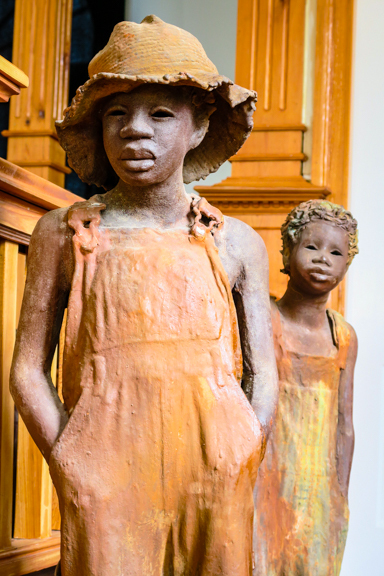 Sculptures by Woodrow Nash, the Whitney Children as seen in the Antioch Church. 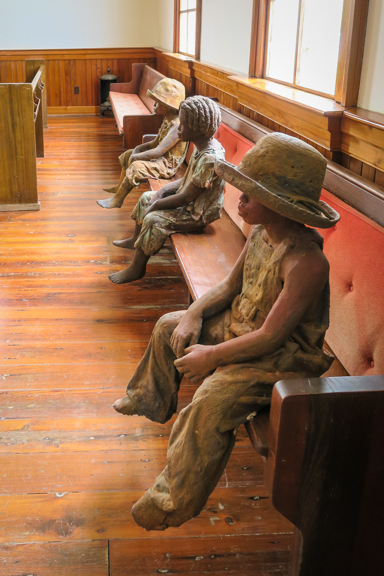 Whitney Plantation opened in December 2014 as the first plantation museum in Louisiana to focus exclusively on the lives of the slaves, and one of very few in the country. 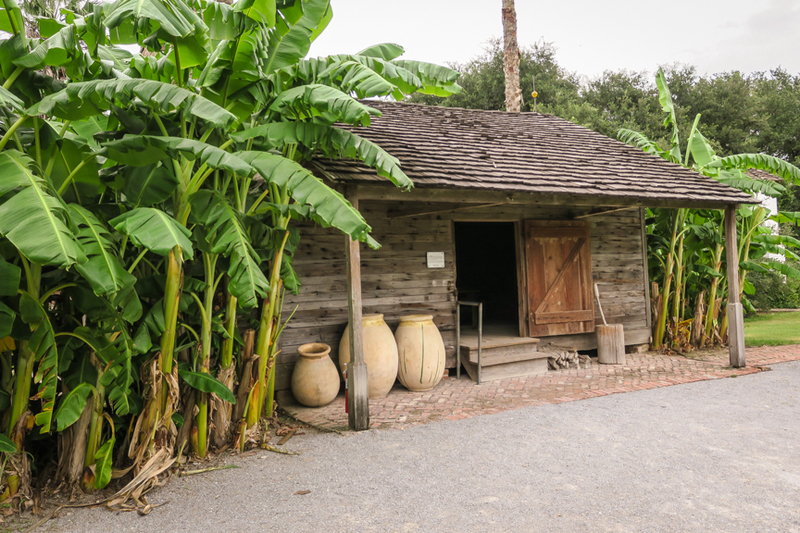 Many of the famous Louisiana River Plantations, like Oak Alley, have finally begun to include slave stories and slave cabins on tours. However, most estates in the Old South continue to focus on the grandeur of the big house and lives of the wealthy landowners. Whitney Plantation portrays the opposite. Whitney focuses the point of view on children because the collected oral histories from the Works Progress Administration (WPA) in the 1930s came from former slaves. These people were children at the time of emancipation in 1865, so their stories came from their youth. Whitney presents their recollections as told in their own words. You’ll find some of the statues scattered around the plantation. Two boys on the porch of a slave cabin. To accomplish this, each visitor receives a lanyard with a card imprinted with a photo and name associated with an individual sculpture. The flip side of the card contains a brief narrative—in the original dialect and vernacular as told to the WPA. These snippets are among the 2,200 collected by the Federal Writers’ Project during the Great Depression. The museum thus brings the past to life when visitors search for the child on their card, find the replica and make a connection. John Cummings, a wealthy New Orleans lawyer, bought the plantation property about 16 years ago. Originally German immigrants, the Heidels (also spelled “Haydel”), were the landowners. They grew indigo and then the more profitable sugar cane from 1752 to 1867. Its second owner named it Whitney, after his grandson. 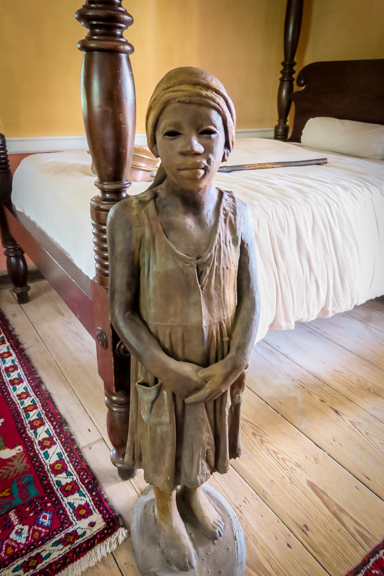 Statue of slave girl inside the Big House. Guides move tours through the Whitney in a specific order. 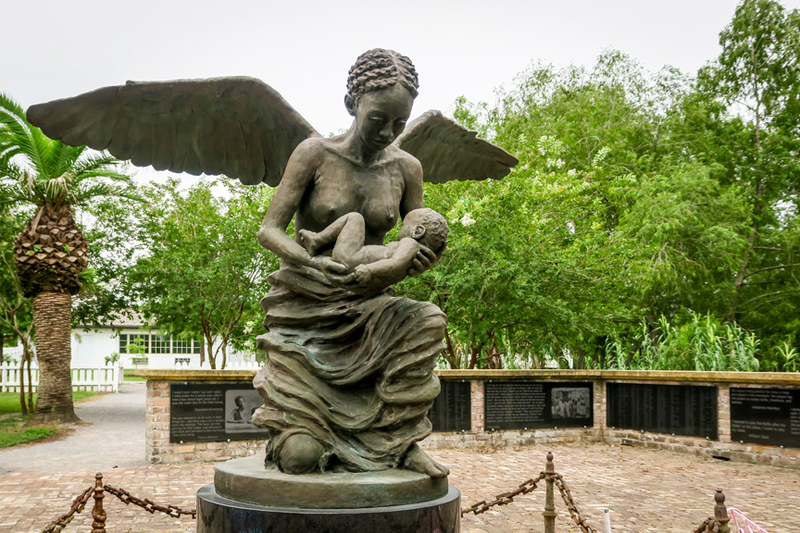 After leaving the church, visitors encounter The Field of Angels, a circular courtyard, featuring a poignant bronze statue by Rod Moorhead of a black angel holding a baby. The area is dedicated to the 2,200 slave children who died before their third birthdays in St. John the Baptist Parish. 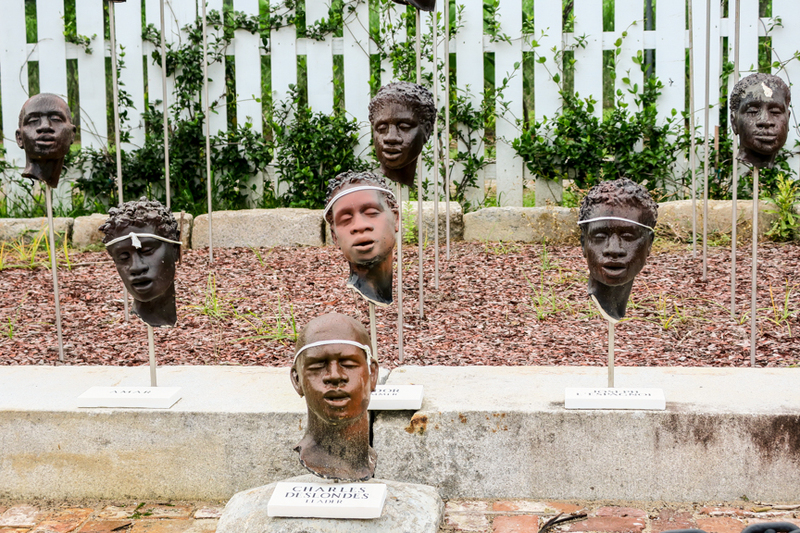 Then, the most shocking part of the tour is the memorial to an 1811 slave uprising. Dozens of black, life-sized men’s heads stand on sticks in the ground. This is a brutal display, but unforgettable art. About 500 slaves participated in the uprising with the aim of escaping to New Orleans. Most never made it that far. Many of the captured were killed — and their decapitated heads were put on sticks along the river to terrify others. 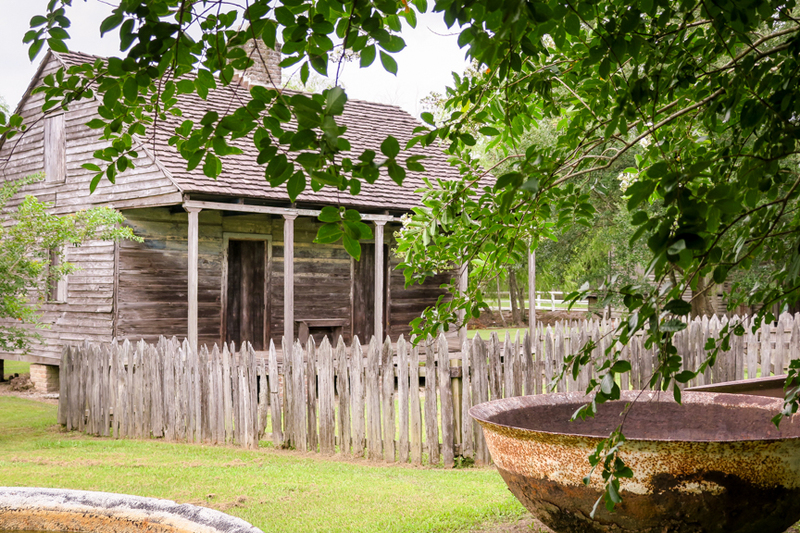 A slave cabin at Whitney Plantation for hold two families. Last stop is the French-Creole-style Big House built in the late 18th century. A few children worked in the house along with other servants. Therefore, another statue of a little girl rests there, in opposition to the fine antique furnishings and artworks. Guides use her to talk about the lives of the house slaves, the long hours they kept and the pallets where they slept on the floor. By the end of the tour, most visitors fall silent. Whitney is an attention-grabbing and moving place. Whitney Plantation Kitchen is the oldest kitchen in Louisiana. 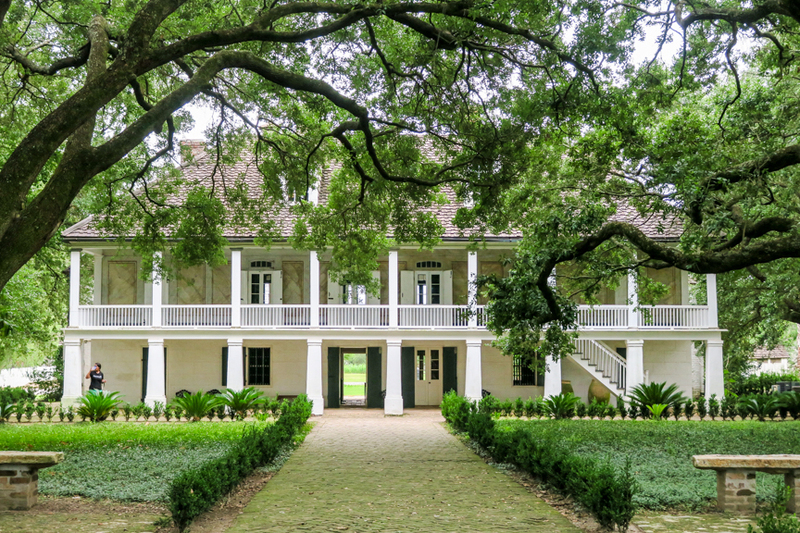 If you go: Whitney Plantation is about 32 miles from the New Orleans airport, 5099 Highway 18, Wallace, Louisiana. (225) 265-3300. Open daily 9:30 a.m to 4:30 p.m. Closed Tuesdays and major holidays. Tours are on the hour from 10 a.m. to 3 p.m. Advance reservations are recommended. Tours cost $22; $15 for students with ID, military, those age 65 and older; free for children under age 12. They are 90 minutes, all on foot and mostly on gravel paths. Those with special needs should call in advance. www.whitneyplantation.com. Whitney Plantation is a member of the New Orleans Plantation Country group: visitnopc.com.